On Cyber Monday I scored the deal of all deals. It was so good, I’m pretty sure it was a mistake. 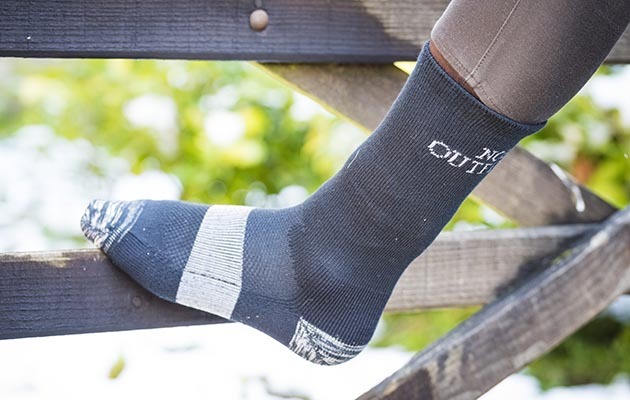 I bought Noble Outfitters Alpine Wool Socks for $0. I didn’t really think my purchase would go through. I thought maybe someone would catch it and either update the order or cancel it outright. They didn’t. I ordered four pairs and it cost me $0. Well, $8 if you count shipping. I gave away two pairs as gifts and kept two pairs for myself. You just can’t have enough wool socks in Wisconsin in the winter. It’s not possible. I’ve now worn them riding a few times and I decided to review them because they’re so great, I’d pay money for them. They’re pretty plain, gray socks. But DANG they are soft and cozy. Super warm without being too bulky. And the light gray band that wraps around the arch of your foot makes the fit really nice while also providing some support. They fit comfortably under my tall boots and my feet were noticeably warm while I wore them. The merino wool is supposed to have moisture-wicking properties, which is a nice feature. And they’re just so comfy. Straight up, these are great socks. Definitely worth the $12-16 they’re listed for depending on where you look. (Here they are from Smartpak for $15.) I’m really happy with these socks and I plan on wearing them around the house all winter (as long as I haven’t worn them to the barn first!). This review is based on my own opinions. I did not receive these from Noble Outfitters in exchange for a review; I fully intended to purchase them with my own money, and would have done if they hadn’t appeared in my cart as $0.